Chef Jayps on a surf check. 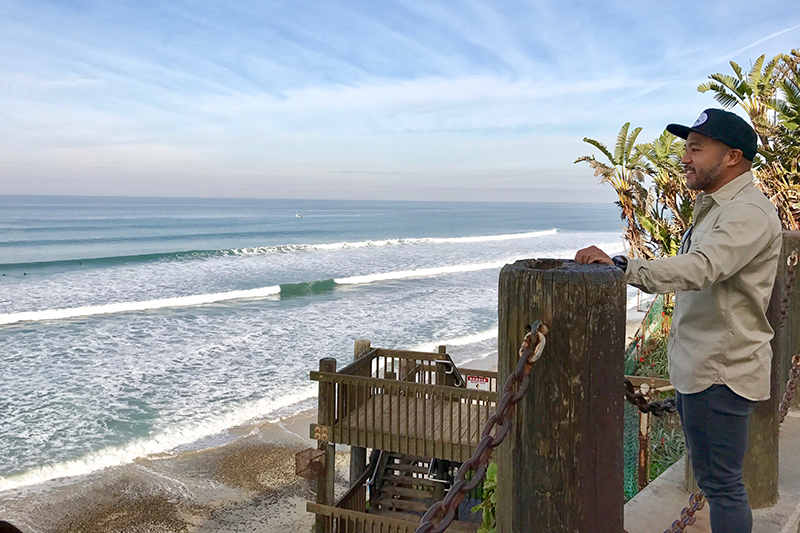 The waves were perfect on his last Cali day, but he chose to do this interview and share a recipe with us instead. Thanks, Jayps! Growing up as a Filipino-American in California, I would get my fix of traditional Filipino dishes when eating at grandma’s house, but we didn’t have raw fish on the table....ever. Both of my grandfathers are fishermen, and I did see raw fish all the time, but that was only when it was being cleaned over by the sink... then it was prepared and eventually fried or baked... but never served raw. Keep in mind that in the 80's sushi wasn't as popular and poke was only available in Hawaii. But still, even to this day, raw seafood dishes are not so much a part of the Filipino menu. “Yes, we have a raw fish dish called “kinilaw” that is closer to being a ceviche than it is poke because we use vinegar as a seasoning. (Vinegar and salt are typical ingredients in Filipino dishes because they were used to preserve food when refrigeration was not available). Where I’m from, this guy Enting Lobaton was crowned the “Kinilaw Master” by the respected Filipino food writer Doreen Fernandez. Some people like their kinilaw over cured because we are used to eating cooked fish. But Enting adds the vinegar just before you eat it… like right before you put it in your mouth. "One of the main reasons we want our fish over cured (or over seasoned) is because we are not sure if the fish is fresh or not. If we slowly introduce the proper way… get really good seafood and cure it in front of the consumer… it’s amazing... it’s beautiful. Most things in the Philippines are bought in a packet because the availability of fresh ingredients is not there, so we just need more education and exposure for raw foods and dishes like kinilaw." Chef Jayps and I having some quality time in the kitchen. 1. In a medium size bowl, season fish with salt and rub with grated ginger. Set aside and keep cold. 2. In a small bowl, mix coconut vinegar, squeeze of calamansi to preference, nata de coco, onions, and slivered ginger. This is your dipping sauce. 3. Plate fish, season with salt and pepper, and dip in sauce for 3-6 seconds before eating. 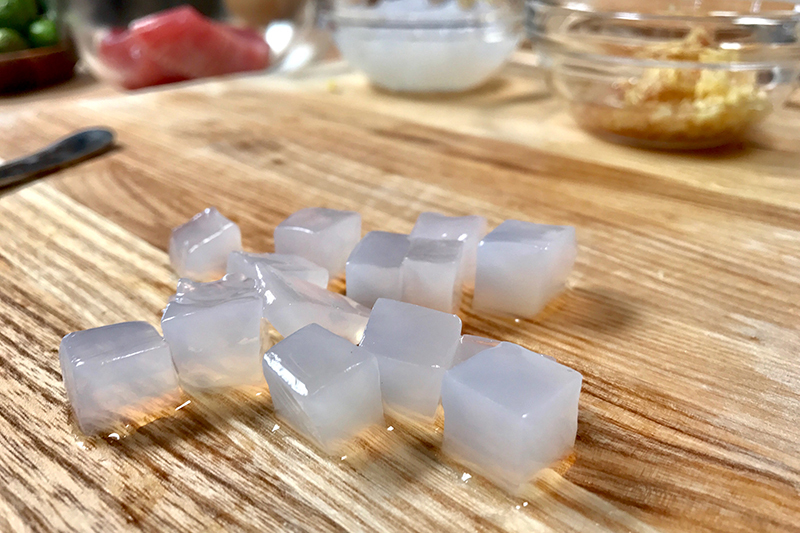 This is the nata de coco, or coconut jellies. They come in different flavors and you can get them at most Asian markets. This is not a traditional kinilaw ingredient. I just had them in my pantry and Chef Jayps decided to use them for sweetness and texture. Cut them up and put them in... if you like. These were "mango" flavored. The sauce up close. Inspiration for us home chefs on how to make something look presentable, using the same darn ingredients.